Any Video Converter Pro. is a professional video converter which can convert video files from various formats with fast converting speed and excellent video quality. It can convert almost all video formats including DivX, XviD, MOV, rm, rmvb, MPEG, VOB, DVD, WMV, AVI to MPEG-4 movie format for iPod/PSP or other portable video device, MP4 player or smart phone. It also supports any user defined video file formats as the output. It has an unmatchable speed and high quality. Any Video Converter Pro. 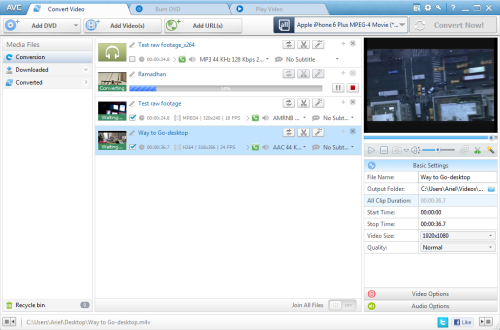 makes it easy for anyone to enjoy the any format video with your iPod, PSP, mobile phone or MP4 player. I ordered this product five months ago. I really enjoy this program for it can convert the video into any formats i want. Now i have also installed another program Any DVD Converter. I highly appreciate this product.